Hello, WordPress! Thank God it’s Wednesday. So sometimes we fall into monotonous routines when there aren’t a lot of disruptions or anticipations, and Josh and I have done just that: wake up, walk the dog, go to work, come home at midday to walk the dog, go back to work, go home to watch The Wire, eat dinner, and finally fall asleep to just go through all of the same motions. What I’ve learned is to be thankful for these quiet days. When I’m upset or stressed, life might seem a little more exciting, but those anxieties are not contributing to my overall happiness. I do have a bit of good news though! Josh and I just found out a couple weeks ago that we’ll each have a poem digitally published in the next issue of Absinthe Poetry Review. This is the first time we’ve ever been published together, and I surely hope it won’t be the last. As if the timing couldn’t be more perfect, our engagement photos we took near the end of August are ready for your lovely little paws. Our good friend, Jerry, is a wonderful photographer, videographer, and animator. If you like what you see, consider visiting his portfolio to see his many other talents. He braved the entire day with us, starting in coastal Cocoa Beach and later in whimsical Mount Dora. I somehow made it through three outfit changes even though the weather was abysmal—upper 90s, bordering 100 degrees, and the afternoon rain was not in our favor either. For those of you getting ready to hire an engagement photographer, I suggest choosing a photographer that you and your partner feel very comfortable with. Though Jerry captured hundreds of very beautiful and mid-blink moments, I found the candid photos more endearing and indicative of the friendship that Josh and I share. A majority of the photos we ended up selecting to share with our friends and loved ones were, really, very silly. We were laughing, looking down, swiping hair away from each other’s faces, and still very much in love. Jerry caught us in our natural elements as opposed to the tasteful rigidity a lot of other couples go for. For those of you getting ready for your scheduled engagement photo shoot, just remember to have fun. It helps to browse through Pinterest for a little bit of inspiration beforehand, but don’t get caught up in creating the perfect shot. We tried a lot of poses that didn’t work out at all, like me and Josh standing on a dock while I was holding him from behind–essentially a pregnancy reversal. There were a lot of photos where Josh or Jerry had said something ridiculous to me right before, so my natural reactions ended up speaking louder than a hard, romantic stare or a thoughtful sidelong glance. Check out just a few samples from our engagement photo shoot and let me know what you think! One traffic light away, Huxley undeniably knows where we’re headed. Then again, I assume that he assumes all car rides either lead to the dog park or thousands of highway miles. I put the car in park and he cries in anticipation. Huxley hops from the sand-ridden backseat of my Honda Civic and pulls me toward the closest entrance. As I lift the first latch, he dances and the white tresses of his tail flit quickly. I lift the second latch and he is gone as quickly as a gannet plunging headfirst into water. A majority of the park is shaded by tall oak and vast buttonwood trees, all shrouded by Spanish moss that hangs and rustles like party streamers left out and abandoned before a summertime storm. Roots run and crawl beneath the loose soil and sometimes jab out above the surface, forming a miniature but treacherous mountain range to navigate. Sparse grass gives way to sand as I venture closer to the water of Lake Baldwin. The lake itself sometimes smells of squandered eggs but also, somehow, sweet like the tang of a dying fruit tree. When I close my eyes and really inhale, it also smells of fresh rain. Before I let Huxley swim, I exhaust a fraction of his energy. With a curved plastic wand, I heave a muddied tennis ball with all my strength. He dashes through the shadows and his polychrome coat shines in the flecks of sunlight filtering through the top canopy. People pass nearby to walk on the short forest trails. When he turns toward me, ball in mouth, heaving and also exultant, he is ready to swim. Active owners never wear nice clothes to a park like this. The ladies with Great Danes often wear cargo shorts and baseball tees. The young blokes with pit bulls sometimes don’t wear shoes at all. I prefer to wear clothes I’d run in: stained, ripped, or unflattering in color. I won’t leave without being slobbered on, jumped on, shook on, or pushed down. Galoshes are also essential. I keep my eyes trained on the deeper, murky water, scanning for alligators or anything that could devastate the tranquil illusion of a lake. My favorite time to go is in the late afternoon, when the wind is still warm and the water is a myriad of reds and oranges. Huxley meets me in the clear shallow after what seems like a lifetime of fetch. Most days, even the swimming doesn’t tire him, but sometimes he’ll visit me while still smelling of mud, lean his weight against my thigh, and look out toward the water as if searching for the sunset. He lies down in the same place he stood, contented by a few hours outside and the companionship of something other than two cats who can never understand him. Josh and I drove from Florida to stay with his family in Ohio for Christmas. Before we even left for the trip, Josh asked me to brainstorm some places for us to stop at sunrise. I chose Newfound Gap for its scenic view. When we realized the road to Newfound Gap was closed for the winter even though there was no snow yet, we turned around and decided to take the Blue Ridge Parkway. There were plenty of overlooks for us to stop by, and the dog needed to be walked. The first overlook we came across was the Oconaluftee River Overlook in the Great Smoky Mountains National Park, just outside of a small town named Cherokee. It was just after 8:00 a.m., and the sun started rising at 7:35. It was 19 °F. I got out of the car and ran to the trunk to put on longer socks. When I closed the trunk, Josh got out of the car. “Don’t get Huxley out of the car just yet,” he said. “Let’s just enjoy this.” He reached for my hand and pulled me over to the edge of the valley. The sun illuminated the summits around us. I snuggled up to him to stay warm and absorbed the view. After a moment of silence, Josh spoke: “You see that? You know, you are my sun. You breathe life into me every morning when we wake up, tangled and tired. I want to create with you.” He suddenly disappeared from my side. I turned and realized he’d bent down on one knee. “I want to combine our blood, make a family, and grow old with you.” He took a dark blue box from his right jacket pocket, coaxed it open with his thumb, and offered the most beautiful ring I had ever seen. “Will you marry me, Breezy?” he asked. I didn’t let him stay on his knee too long before tackling him and saying yes. After thirty minutes of hugging, kissing, and then running laps with Huxley around the overlook lot, we took a sunrise tour of the Great Smoky Mountains. We were the only car on the Blue Ridge Parkway that morning. We both held hands in silence, smiling, realizing one piece of our future was certain. When was the last time your sense of smell sent you directly pining for your childhood? For me, this used to happen daily. Until recently, I hadn’t experienced that rush of déjà vu in a long time. When I first moved to Florida at the age of 15, I had made the conscious choice to relocate. I threw my big girl pants on after my freshmen year of high school and decided to try out Florida. Regardless, the monumental change of scenery took its toll on me. I clung to reading to escape what could possibly have been a mistake, and my only sense of comfort? Yankee candle’s “Autumn Wreath” and “Macintosh Apple”. I kept the candles on the windowsill next to my bed, close enough to smell them as I tried to fall asleep. The fragrances reminded me of apple-picking and climbing trees as they lost their leaves. However, enough time passed and I grew comfortable to Florida’s salty air. I am perhaps one of the most nostalgic people I know. I allow silly smells, the feeling of a light breeze, the warmth of the sun, and a casual phone call pull me into sentimentality. This very morning, I awoke to a phone call from my closest childhood friend. She sounded depressed, so contrary to her happy demeanor. As I listened to her refer to work as “monotonous” and employ other negatively-tinged words to refer to her current activities, I reverted back to our childhood together. Never before have I heard her voice so monotone, so defeated. I wanted to be there, in New Hampshire, dragging her out into the field where we used to play “make believe” and running around with her family’s horses. She was the freest spirit I’d ever known. Is this what adulthood does to free spirits? Does it strip them of their purity and their joy? To distract her from her unhappy rantings, I prodded her about gardening and The Food Network. Slowly but surely, her tone broke free from its jail cell and emphasized a small, but significant, presence of the little girl I once knew. I was overjoyed to hear my best friend again, overtaking the defeated adult her identity was assuming. I’ve never been very close to my maternal grandmother. Perhaps I could have tried harder, but it was hard for me to love and appreciate the stern German, Lutheran woman that she was when she only ever pointed out things I did inadequately. But as I’ve gotten older, I have learned to appreciate her as a woman, with a life full of experiences long before I ever existed. I’ve learned a small smattering of biographical accounts, and the most enjoyable to hear was the story of how she met my grandfather. 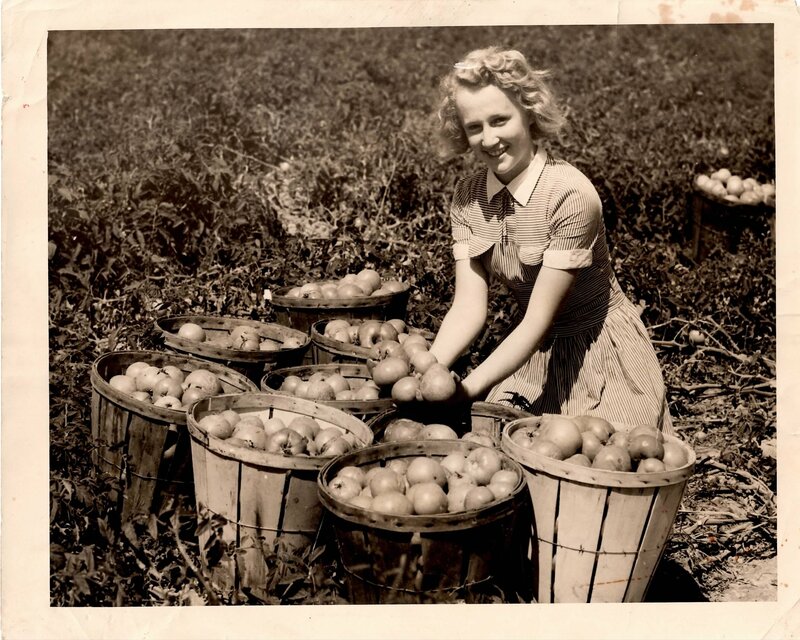 In 1930s-1940s Maryland, my ancestors were farming businessmen and politicians. My maternal great-grandfather was one of the largest poultry producers in the state. He had some sort of arrangement with a Maryland politician named Rieck. They threw a gathering, adjoining the two families for dinner. 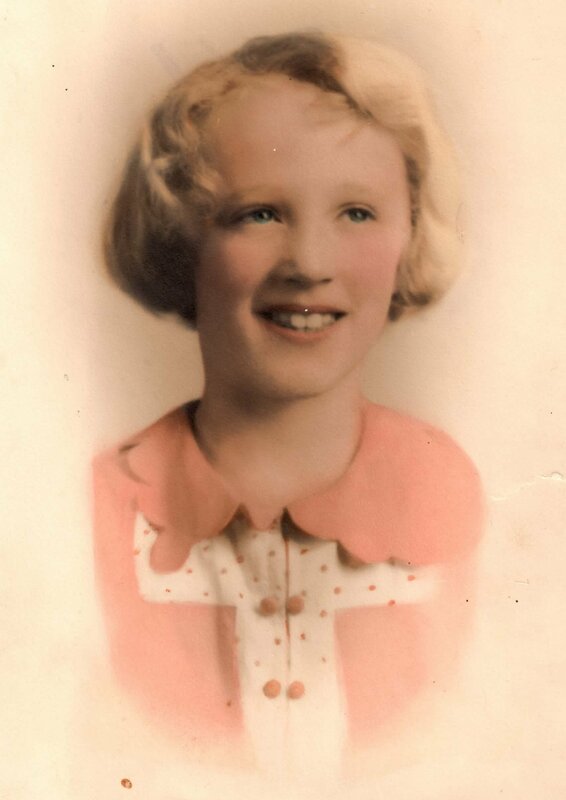 My grandmother, Jean, was 12 years old at the time. She met two of Rieck’s sons, the younger named Carl. The two boys tussled and fought to see who would accompany Jean on the tandem bicycle. Carl, even though he was the youngest, popped his brother in the face and won the honor, but he was punished for it later on.